Since joining Microsoft back in mid-2006, my weight skyrocketed about 15% or 30 pounds. A large part of this can be attributed to the abundance of unhealthy, free food at Microsoft, but that’s only half of the story. When I worked at University of Calgary, I had to walk at least a mile and a half each day to get to and from various transit points. Now, the parking lot is at best 50 meters away from my building. While I might have complained about walking around in -20 degree weather in Canada, I really had no idea how good it was for my health. Up until recently, I didn’t know just how bad Microsoft’s free perks such as unlimited soda and the constant supply of junk food outside co-workers' offiices were really harming me either. That said, my health is my own responsibility and I shouldn't have listened to the demons in my head that kept telling me to eat more. Flash forward to January 2011. An annual check-up revealed that my “fatty-liver” condition (human equivalent of foie gras) diagnosed in 2008 had progressed such that I now have either gallstones or possibly even a growth in my gallbladder. I was only 30 at the time! Any ways, this was exactly the ‘scare’ I needed for a major lifestyle change. My amazing wife letting me know that my snoring had gotten far worse since moving to Seattle wasn’t enough. Fear of cancer and Microsoft’s announcement that our 100% healthcare would disappear in two short years skyrocketed me into action. By chance, I came across a wonderful blog post, http://www.crockford.com/pwl/, by Douglas Crockford which explained our society’s current obesity epidemic and gave some awesome advice on losing weight. If you haven’t read this post before, I highly recommend it as it’s quite logical and well thought-out. Concurrently, I was also trying to abide by Dr. Sandra Cabot’s advice she gave in her book, the Liver Cleanse Diet. The basic premise of the book is that the liver is solely responsible for removing fat from the bloodstream, and an unhealthy liver implies you’ll pack on the pounds. Well, the way my “fatty-liver” was diagnosed was via blood tests looking for chemicals the liver releases when it’s under duress. I even jumped off the wagon for four days while on a business trip last month and have lost five pounds since then! The type of not a number is number... Seriously, what were they thinking!?! Far worse is the result of 'parseInt("number")'. This produces NaN! Astute observers will notice the "Do something else" piece is incorrect as the left parenthesis needs to be on the same line as the IF statement for this to work. For some reason I cannot fathom though, Windows allowed this mistake to run correctly. Well as soon as I did a global search/replace on "ABC" to "DEFG", lo and behold Windows decided this was in fact a grammar mistake. Spent an hour or so digging through "a bunch more cruft" (quite more significant than the three lines I've abstracted it to be) to figure out what the underlying issue was. Where exactly is this improvement coming from? Well we don't know quite yet. Our first bona fide .NET 2.0 SP1 versus .NET 4.0 IronPython perf suite run occurred less than two weeks ago! An educated guess is that at least a small portion of this improvement stems from the fact that Microsoft.Scripting.Core.dll is actually part of the .NET 4.0 framework. Any ways, you can see more of the performance characteristics of IronPython running under both these .NET releases here. 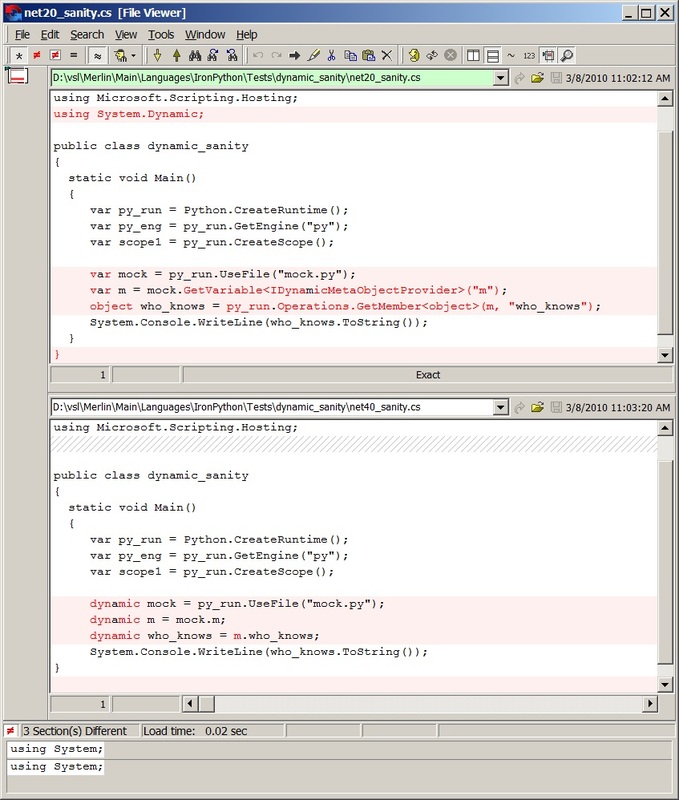 The screenshot above shows a small C# snippet of code utilizing a Python module both as a .NET 3.5 application (top) and as a .NET 4.0 application (bottom). Both of these snippets have been diffed to highlight differences in red. It should be blindingly obvious that the bottom snippet is far more readable due to the use of C# 4.0’s new dynamic type. What the hell’s an “IDynamicMetaObjectProvider” supposed to be any ways? In any event, our DLR and IronPython hosting APIs are adhering more to the Zen of Python with each release. IronPython 2.6.1 for .NET 4.0 and IronRuby 1.0v4 are the first two major releases of these dynamic languages that share the same Dynamic Language Runtime pedigree. The end result of this is that they interop together quite nicely out of the box with one small caveat: you just need to copy “IronPython-2.6.1-Src\IronPython-2.6.1\Config\Signed\App.config” from the source or binary zip file releases to “%ProgramFiles%\IronPython 2.6 for .NET 4.0\ipy.exe.config” and/or “%ProgramFiles%\IronPython 2.6 for .NET 4.0\ipy64.exe.config”. This configuration file tells IronPython which version of IronRuby it needs to load, and we simply forgot to include this file in the IronPython MSI installer. Begin heating oil as soon as the meat is tenderized. Take tenderized steak (cube steak) and salt and pepper both sides to taste. Dip meat in flour to cover on both sides. Shake off excess. Beat egg into buttermilk. Dip flour covered meat in egg mixture covering well. Dip meat back into flour. Test oil by dropping a small drop of water in it. If it splatters, it is hot enough. Place meat into hot oil and fry on one side until brown. Turn meat and cook on other side until brown. Check for doneness. Turn and fry some more if needed. Sometimes a salt and pepper the flour too. I use bacon fat for deer steak or any wild meat. I like it for beef too, but it is not always available. This release contains a few small Silverlight fixes, with basically zero changes to the Desktop version of IronPython. Hopefully third time's a charm. We've heard from a few people in the last week that they're having trouble uninstalling our community technology preview of IronPython running under .NET 4.0 Beta 1 if the installation of .NET 4.0 Beta 1 has been removed or replaced in some fashion. Basically what's going on is that a prerequisite for running IronPython.msi (whether you intend on installing/repairing/removing it) is the presence of a very specific version of .NET - namely v4.0.20506. The tie in to this .NET 4.0 release means that even with an install of .NET 4.0 Beta 2, you'll be unable to remove the IronPython CTP for Beta 1 cleanly unless you also have .NET 4.0 Beta 1 installed concurrently (is this even possible I wonder...). There's at least one alternative to removing "IronPython 2.6 CTP for .NET 4.0 Beta 1" if you no longer have access to .NET 4.0 Beta 1 on your machine. Basically you'll just need to remove the related installation directory and shortcut menus by hand. Also, there's those pesky registry entries that don't have to be removed, but can be if you prefer. rmdir /s /q "%ProgramFiles%\IronPython 2.6 CTP for .NET 4.0 Beta 1"
rmdir /s /q "%ProgramData%\Microsoft\Windows\Start Menu\Programs\IronPython 2.6 CTP for .NET 4.0 Beta 1"
What do you want to know about IronPython? While I've been waiting for a huge build to finish unzipping on a shiny new Windows 7 test machine, I've been looking over my own and other IronPython team members' blogs. I've come to the conclusion that there are far more comments for posts not dealing with Python, and in many cases the IronPython posts aren't getting any comments at all. The missing interaction isn't necessarily limited to technical posts either from what I've seen. Is this because we're doing a great job at covering IronPython topic xyz or because xyz just isn't that interesting? If it's the latter, what would you like to see more of and less of?